On June 25th, the Supreme Court announced their 5-4 decision to functionally disable a large portion of the 1965 Voting Rights Act. While the court’s decision let the law stand, it struck down section 4 of the act and has necessitated Congress going back to decide how to determine which locales must get pre-clearance for voting law changes. 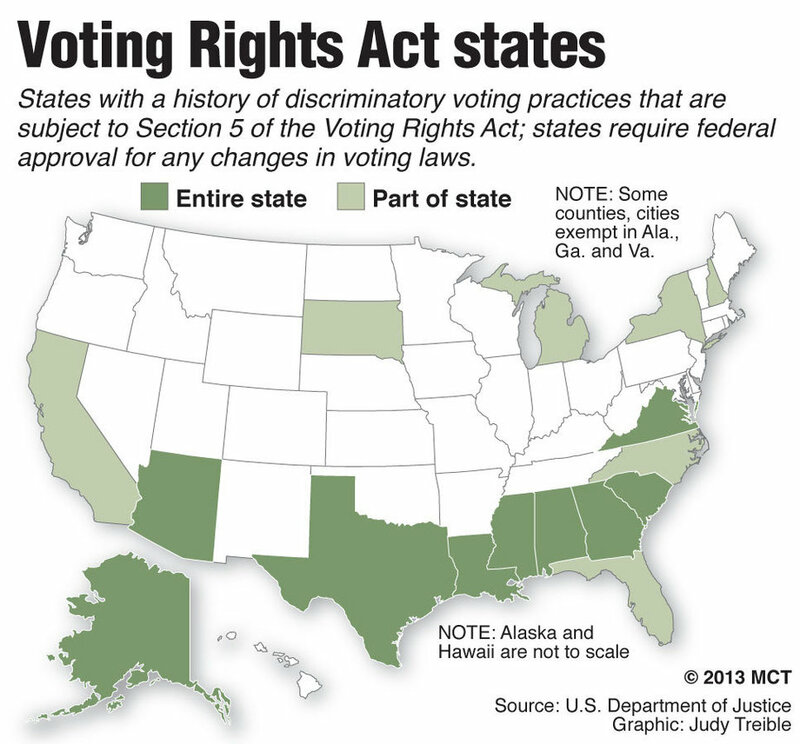 The original Voting Rights Act banned the use of measures like “poll taxes” and “literacy tests” and instituted a system to preemptively stop new voter disenfranchisement laws; over its fifty year lifespan, it has been extremely effective in protecting the voting rights of racial minorities. In areas which have a history of voter disenfranchisement, the state government must seek “pre-clearance” of any voting law changes from the federal government—if the federal Department of Justice clears the changes, they are enacted, but, if the DOJ suspects that the changes would be discriminatory, the law is automatically blocked from ever taking effect. With the invalidation of the 4th section of the Voting Rights Act, the Supreme Court has sent the selection method for locales which require pre-clearance back to the legislature. 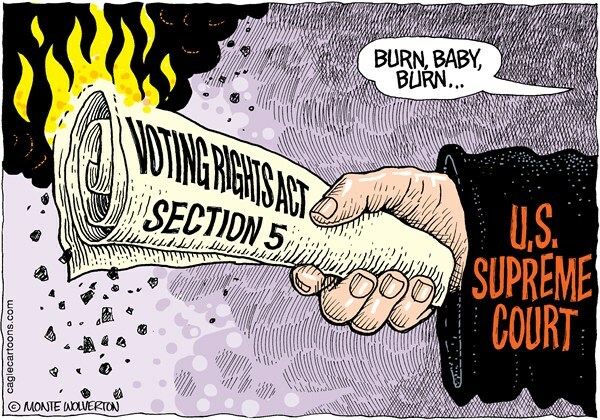 Until the 4th section of the VRA is restored, the 5th section is inactive (there is no way enforce pre-clearance once the method by which we decide who need such pre-clearance has been deemed unconstitutional) and nobody is safe from voter disenfranchisement. If they can find a new method by which they determine whose laws must be pre-cleared, then the law can be fixed and the 5th section of the Voting Rights Act will remain intact. The Supreme Court’s actions are both partisan and extreme. 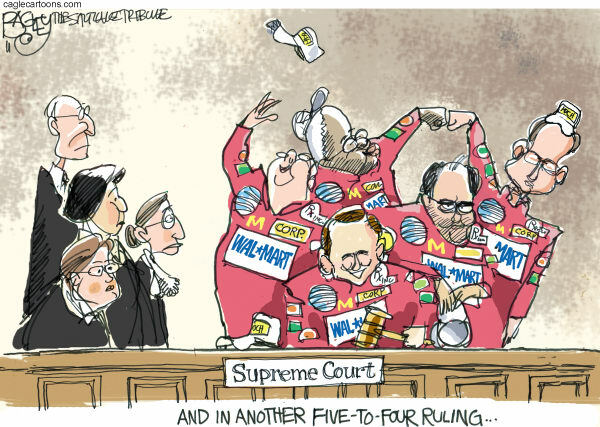 As with many other controversial decisions in recent years (Case in Point: Citizens United), this case was a situation where the conservative block of the Supreme Court overturned settled law in service of their political agenda. The ugly truth is that our right wing has become increasingly limited to white voters and it is in their political interests to get their allies on the court to destroy the legislation which prevents them from making it difficult for minorities to vote. The conservatives on the court clearly know how dysfunctional the current Congress is—it can’t even agree on whether or not to authorize payment for things that we have already bought—and are likely banking on the Congress failing to make new standards for selecting who requires pre-clearance. In the absence of a new method for determining who requires pre-clearance, the 5th section of the Voting Rights Act is functionally dead and states which want to discriminate will do so. In fact, on the very day that this case was decided, the Texas attorney general announced that the state’s voter ID bill would take immediate effect, since the Voting Rights Act no longer could require them to pre-clear voting law changes. Without the Voting Rights Act functioning, there is nothing to stop the passage of voter ID laws which disenfranchise huge numbers of voters and Texas’s actions are merely the start of a flood of such legislation. The VRA is akin to insulin, in that it keeps a deadly and debilitating condition at bay. The Supreme Court decision on the VRA is analogous to a diabetic’s doctor arguing that insulin injections are no longer going to be administered because insulin has been successful in keeping the patient healthy. Yes, things are better today than they were in the past on the issue of racial discrimination at the voting booth, but this is, in large part, BECAUSE of the Voting Rights Act. It is simply laughable to argue that the fact that we have had progress makes the reason why such progress was possible unnecessary. Supreme Court Justice Ruth Bader Ginsberg wrote an incredibly scathing dissent to the conservative block’s decision, going as far as to say that “Hubris is a fit word for today’s demolition of the VRA.” In this dissent, she points out that nobody, not even the conservative justices who just crippled the law, argues that the VRA didn’t work and that the conservatives’ argument is simply that they don’t think that it is necessary any longer. I agree wholeheartedly with Ginsberg’s dissent and would go one step further: unlike Ginsberg, I believe that the conservatives on the Supreme Court are not just wrong and guilty of hubris, but are guilty of trying to subvert democracy—they know that the right wing cannot win fair elections anymore and have decided to facilitate voter disenfranchisement in order to prevent their unpopular ideology from continuing to lose ground. The extreme right wing is dying out due to their demographic problem (they can’t appeal to anybody but white men), and the right wingers on the Supreme Court are handing their political allies a gift. Thomas is a fool who decides how to vote based purely upon partisanship and his affiliations to extreme-right wing corporate groups (which support voter disenfranchisement). Roberts has been trying to kill the Voting Rights Act ever since he was tasked to do so as a lawyer in the Reagan Administration. Alito is a pure partisan who will toe the conservative line come hell or high water—his support for gutting the VRA is based purely upon the fact that such a gutting is the conservative ideological line. Fortunately, there is a very simple solution to the Supreme Court’s neutering of the Voting Rights Act: the American people must make a political litmus test out of support for extending the pre-clearance requirement over all states and cities in the United States. We must make it clear that no politician of either party to obstruct the repair of this law will be allowed to stay in office after their next election. If a politician doesn’t support the restoration and expansion of section 4 of the VRA to cover every jurisdiction of the United States, they should be primaries and replaced come election time. In the face of a threat to democracy itself, no politician should be exempt from consequences of obstruction. Josh, I enjoy reading your articles very much. Thanks. In this case, I have heard many say that IDs are required for everything else, why doesn’t it make sense to make them a necessity for voting? Seems logical. But perhaps there is a reason minorities cannot get legal IDs. But why not? If they are illegal, then they shouldn’t be voting anyway, right? I only read part of the bill and part of the dissent, so I don’t know fully well what it attacks, what it dismantles, etc. Could you please explain how this will actually make it more difficult for minorities to vote? Thanks. First, the legislators intentionally select types of identification which are not held by constituencies which don’t vote for them (ex. some ID laws allow gun permits but not state university identifications). This is fundamentally a violation of the equal protections of the Constitution. Secondly, once ID laws are in effect, legislators begin making it as hard as possible for new people to get such IDs–they increase the price of processing applications (a de-facto poll tax), decrease hours of operation to normal business hours on weekdays (when poor people cannot get out of work), and closing application centers in urban areas (making it difficult for urban minorities and low-income people, who tend to use public transit rather than cars, to get to the application center). As there is no voter fraud problem, it is clear that the sole purpose of these laws is to disenfranchise voters through the back door. They are no better than the old “literacy tests” and poll taxes. Beyond the simply idea of IDs, the VRA protected against numerous other tactics; for example, Texas’s new voter law (announced less than 6hrs after the decision was given) puts in place voter ID, but it also makes it so the majority racial minority polling places serve 10X more people than majority white or high income areas (thus making huge lines), restricts voter registration and cancels early voting. Thanks so much. I figured it was more of a logistics issue. Seemingly “legal” on the outside, but targeting those who cannot “afford” the “extras,” like getting off of work to get an ID. In my own case, I didn’t have a driver’s licence until 21 or so, but I did have a basic State ID, which was free of charge (or a very low fee, though this was 15-20 years ago). I am wondering if this would be possible. You mentioned that a university ID, for example, would not be accepted, whereas a gun permit would be accepted. PS I know it’s ridiculous, but there are often articles on yahoo and such–I believe most news nowadays is just entertainment and not news–that post ostentatious headlines and there are myriad stupid comments. Is there a way to get these (your) kinds of messages out to a larger public? I guess that would presume people can read and want to read! Thanks again for the clarifications. Good grief, you were correct in your prediction of this Josh. Right on the money. It was so interesting to hear that the Senator who stood for an 11+ hour filibuster to stop a bill to close all but 5 women’s health clinics in Texas two nights ago, had sued using the VRA to protect herself from being gerrymangered out of a district. And of course within two hours of the Extreme Court’s decision, Texas legislators were busy making it so that she’ll have no district to run in again. We must to get this legislation restored!